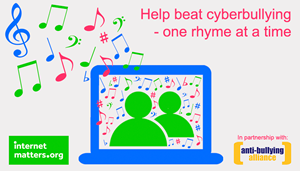 Safeguarding Essentials – Can your school help beat cyberbullying – one rhyme at a time? Can your school help beat cyberbullying – one rhyme at a time? This year, Anti-Bullying Week (17th-21st November) is calling on the school community to take action to stop the bullying of all children and young people. With more and more children owning mobile devices and spending longer online and on social media, cyberbullying is becoming one of the most common forms of bullying and the source of increasing distress to children and concern to their parents and school leaders. There are separate competitions for Primary and Secondary schools. The winning Primary school will receive a visit and inspirational assembly from Olympic medallist Christine Ohuruogu MBE, and the winning Secondary school group will enjoy a special daytrip to Sky’s TV studios in West London where they’ll make their own film. To support schools participation in the competition, there’s also a lesson plan for teachers on how to help children understand the issues and lead into the creation of their competition entry. This includes notes on how the activity supports the wider curriculum. The competition is open until 28th November 2014 with the lesson plan and full details about how to enter on the Internet Matters website. Start getting creative!